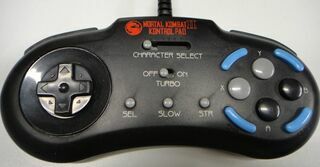 The Mortal Kombat 3 Kontrol Pad by Innovation is a third-party six-button controller for the Sega Mega Drive, complete with added turbo features. It was designed to assist players with the Mega Drive version of Mortal Kombat 3, having a selection of each character's moves mapped to extra buttons. Similar to the older Mortal Kombat II Kontrol Pad, the controller uses cartridges containing move data which that inserts into the slot on the back. Two versions of this controller were released, each with moves for different characters on seperate cartridges.